Zenith Nutrition Alpha Lipoic Acid is a natural compound that functions as a co-factor in vital, energy-producing reactions. This powerful antioxidant is also called as a universal antioxidant that promote cardiovascular health and helps protect the body from free radical damage. It is effective in water-based substances such as blood, while its reduced metabolite, dihydrolipoic acid is effective in fatty tissues and membranes. Functions as a co-factor in vital, energy-producing reactions. Promotes cardiovascular health and may increase levels of glutathione. Enhances the antioxidant activity of vitamins C, E and coenzyme Q10. May provide protection to the brain under conditions of damage or injury. 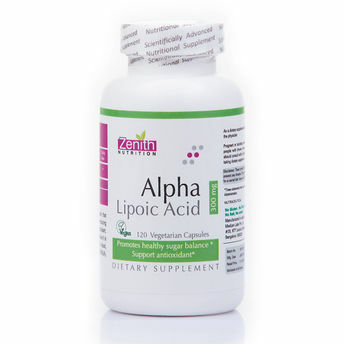 Alternatively, you can also find many more products from the Zenith Nutrition Alpha Lipoic Acid 300 Mg Capsules range.